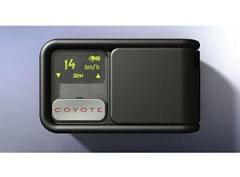 What I like about the Mini Coyote dashboard device from Novus is that it allows drivers to unite together and alert each other of impending speed cameras that have been spotted, giving you time to slow down, feign innocence and act as if you’d never dream about going above the speed limit. A nifty little button can be found on the device and a simple press of said button transmits the location of the money grabbing speed trap to a processing centre. Better still, the information is relayed back in a matter of seconds, giving the driver travelling at least 300 yards behind ample time to slow down. It’ll even tell you how long it’ll take before you hit the camera too. There’s no room for error, which essentially means the end of speeding fines pouring through your letterbox. Understandably, upholding officers of the law will frown upon such a device, and road safety groups are already criticising it claiming it will “undermine the ability of police to enforce the limit because drivers would be able to speed with very little risk of being caught”. Whereas drivers (especially the speed kings) must be ecstatic, punching the air while simultaneously squealing “woohoo”. Party poopers have already rained on the parade by stating that people using the Mini Coyote “could be prosecuted for perverting the course of justice” But the president of the AA has said prosecuting someone for warning other drivers of speed cameras would be “extremely difficult”. Could this nifty device spell the end for infuriating speeding tickets? Sounds like a green light to me. You slow down, no more points on the licence and everyone (bar the law) wins. Sarah&apos;s Shiny Science: Obama wins, scientists rejoice! Now it can’t just be me that feels like this? Obviously having people tip me off …sounds good! So whats stopping the coppers using this device for traffic calming and filling the databse with hundreds of bogus spots around the UK? Hmmmm, I don’t see hos this can be “perverting the course of justice”. Drivers will slow down. Isn’t that what the speed limits are about? Or do I read between the lines that the speed limits are indeed a cash cow and “the law” is now concerned about their income? Presumably this will lead to more cars slowing down rather than speeding and getting fines. Where’s the problem? Of course should anyone have an issue with it could they not buy one and press the button randomly to register phantom speed cameras?